The Arne Jacobsen Egg Chair has been highly popular since it first appeared in one of Copenhagen's most exclusive hotels in 1958. Its unique shape quickly became admired around the world. The curved frame created a cosy haven that offered privacy even in a bustling hotel lobby. People adored the Egg Chair and in return a new furniture icon was born, which is now available in a furniture version at STIN.com. Care : Use leather care oil. Do not wash the leather or metal base with water. Do not place in direct sunlight. Assembly : Partly assembled. Easily assembled by attaching the base to chair - 2 people needed. Despite a slight delay of our ottoman, we are fully satisfied with the service, we were continuously updated us on progress. The quality is top notch. I bought the Egg in black leather last year and I´am still really happy with the chair! I like to order again. Has bought the egg on 01.09.09. I am very happy with the chair, the quality corresponds completely to the expected. Packaging was good. I am really satisfied with my chair. It lives up to my expectations. Sinceit has tilt, it is recommended that you also purchase footrest. I´m getting one. The chair arrived on time. Packed in and protect t as if it should never be unpacked again :-) The chair is incredibly good finish and we must admit that we were positively surprised. We are considering buying a style anymore. We bought an Egg chair in tan and are really happy with it. This chair is really elegant and every day we’re so pleased with just how great it looks in our home. I bought the Egg chair in black aniline leather. After a bit of a wait it finally arrived, it’s super. It meets all my expectations. I would strongly recommend that people buy furniture though Stin Furniture, because the quality is super. I’ll definitely be buying again. Really nice chair, super quality and great sitting in …. For approx. 1 ½ years ago we bought Egg from Stin. Unfortunately, there was an error on the chair's feet in the autumn, and I turned myself to Stin to check whether the problem could be remedied. After briefly mailkorrespon-dance, I was told that a new egg was placed on order for me to replace the chair with errors. After approx. 14 days, we received the chair free of charge. The chair is perfect and we can see that the errors that occurred on the first chair can no longer arise, because the attachment to the foot is changed in this release. A very nice and fast handling of our complaint and we are fully satisfied with the solution. "an egg in the basket"
We received their eggs just before Christmas. It is already part of our living room. We are pleased to chair, and it is a very nice finish to the leather. "We now have several trading Stin, the products are always in good condition, the praise they should have. Little wormwood in the cup there was here 14 days ago when we received" "Egg," "chair was nice, but 5 days receipt, we get a mail on stockholding, okay, we've waited 12-14 weeks, but you suddenly have " the egg " on stockholding and may spar up to 3,000 kr further makes us right ærgelige. so we dare not buy products on Stin longer, for when the price is right? " We are very pleased with the "egg". The quality is great and we look forward to receive the stool in week 46. The chair is admired by all who come into our home. Fantastic service. Fantastic products. Looks great and a furniture upholsterer in the family has said how well it’s made. Arne Jacobsen designed the chair, but since he’s dead he has no say in how it should be produced. If you like designer furniture, buy it from Stin. Where is it easy to order from OSKAR.com - it's a pleasure to browse through all the nice furniture and you are very inspired. How do you sit in the "egg"
Fully satisfied with the product received. Where is it easy to order from Stin.com - it's a pleasure to browse through all the nice furniture and you are very inspired. "Hi Kenneth, I must honestly say I was very nervous that the goods were not leveret.Men they arrived on time and a very secure packaging." If you did not know it, you would think it was genuine. Good customer service! I would strongly recommend that people buy furniture though OSKAR, because the quality is super. 'm Really happy for our eggs. Sits well - here both knit, read and seen television. Received the chair at the agreed time and quality is super. Is really happy and the chair comes in a really solid package. Would however wish I had bought the podium in the same place! "Good service from Stin, safe and careful packaging, time horizon held, and if there were questions along the way, there were answers in given back in only short time. The chair is well made and we can only be satisfied"
The order came on time (despite the Christmas holiday). A big colossus - well packaged, as we have been looking forward to since - a bargain! The Egg chair live up to our expectations - a very nice chair. A small complaint from our side is that the payment did not go as expected! A bank transfer is a problem for Stin.com - very difficult for Stin.com to handle such a payment! VISA payments are no problem! Hope this will change going forward. Beautiful chair that fully live up to expectations - but a bit difficult to assembly. I am very satisfied with the handling of the entire process of my purchase, both at OSKAR and carrier, but the chair is a little harder to sit in than expected. Very nice piece of furniture. Can not tell the difference between the original and Stin-egg. A great buy and will definitely do business withVoga again. I bought the egg this year. It's a very nice chair that fully meets my expectations. I am very happy with the purchase. The chair lives up to our expectations. I bought the egg with ottoman in aniline leather and the furniture are super nice. We will soon order be some more furniture. We bought the egg, and are extremely satisfied with your purchase.We are pleased with the Egg and I am quite sure that it is not the last we bought here. Super nice car and great service. Leather quality is top notch. I am sohappy with the chair that I immediately ordered another. Despite a small delay with our footstool, we’re really happy. Your service team kept us fully up to date on what was happening. The quality is excellent. "Good service from OSKAR, safe and careful packaging, time horizon held, and if there were questions along the way, there were answers in given back in only short time. The chair is well made and we can only be satisfied"
I am very satisfied with the handling of the entire process of my purchase, both at Stin and carrier, but the chair is a little harder to sit in than expected. The product came as notified, well wrapped. The chair has fully lived up to my expectations, it is I am very happy. I have for a long time wanted the egg chair and when I finally got it the chair completely lived up to my expectations and more. It is incredibly beautiful and you are sitting fantastic in it. So I can certainly recommend it. Bought a black egg with stool, egg came quickly and well packed. the leather is soft and seemed to be of good quality.would shop here again. Bought two of these chairs and I'm happy with the purchase. The service is good. Super nice chair looks great in my home and a fantastic service - I discovered a problem with my chair and immediately when I wrote ato OSKAR, I was offered an exchange without any cost. So OSKAR gets my warmest recommendations - I don't regret my purchase with OSKAR at all. We have purchased Egg with ottoman in black leather. Very niceedition and beautiful finich. Good service all the way from VogaFurniture. Can only give good recommendation..
After purchasing the Egg (replica), we unfortunately received a chair with some bruising and discoloration in the leather. We took some pictures of it and sent in to OSKAR. After some waiting, we exchanged the chair and we can now enjoy it fully ... ps. is a good breastfeeding chair. Satisfied, but not completely stitched trim around the handle to tilt the device is quite as good as expected. The acquisition process entirely by expectation. The only fly in the ointment was that 2 days after I ordered were announced a 20% discount and a free Hang-it-all. Practice. A polite request, I wonder if could also obtain this offer gave unfortunately the web - not even a free Hang-it-all. Lovely chair. The leather is of very high quality. Departs slightly from the original, but a chair that is worth much more than what you you pay. "Fully satisfied with the chairs good quality. They were not as promised, but was 3-4 weeks later lev. Have only fortrut we did not fodskam with,"
Super nice chair, in a really nice quality. Everything went exactly as promised. In pakning was perfectly well. I buy with pleasure again at OSKAR. We are very pleased with our Egg (replica) in black leather. The quality is impeccable, only someone with knowledge might distinguish the seams from "the right thing". Purchased the egg with ottoman in black leather. Fine quality and livedup to my expectations. Highly recommended! The chair is a little harder to sit in than expected. I am very satisfied with the handling of the entire process of my purchase, both at OSKAR and carrier, but the chair is a harder to sit in than expected. 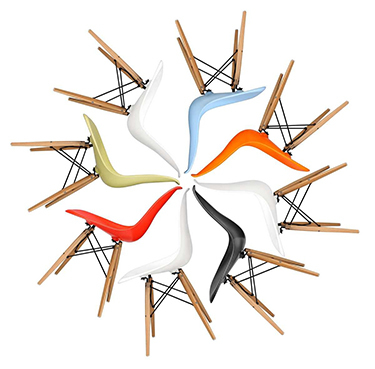 "Incredibly beautiful chair which one fits in. However, one could wish for stitching a little nicer!" "The chair is in order and the quality seems good. But there are things like Stin should improve. Bookings: Bookings on the website went completely wrong, since my order apparently did not go through and I got a message that it was canceled. I ordered, therefore, the chair again. it should, however, not have done that. it turned out that on my bank account I was charged for two chairs. to correct this, required much work and it took more than a week for Stin to return the overpaid amount . Greeting Ulf Kjaersgaard "
A fantastic service and a really good product. It is not the last time we shop at Stin. Absolutely beautiful chair and good service which I can onlyrecommend. We bought the egg in brown and are very satisfied. The chair is incredibly beautiful and we look forward every day by how it looks in our living room. Overall satisfaction with appearance, but tilt function does not quite optimal. Our copy of "egg" fully excedes expectations we had for the purchase.Beautiful leather, nice stitching - not to see that this is not the real thing. I've always thought that the egg is super nice but too expensive "original " version. Did this replica model at Stin and I really must saythat it is a nice quality and good comfort they have been made. Very good communication and super service from Stin. Great service. Great products. Well done and approved by furnitureexpert in the family. Arne Jacobsen drew the chair but decides after his death,not where it should be produced. Do you like the designers' furniture, buy them with Stin Furniture. Super nice chair, in a really nice quality. Everything went exactly as promised. Inpakning was perfectly well. I buy with pleasure again atVoga Furniturniture. If you could afford an original egg, it would probably be a BMV in the driveway, but for us "ordinary" people, we made ​​do with a replica.Unfortunately, so is my economic picanto not quite as close to an A6 `sas I had hoped, but my eggs are fairly close - so this is a good opportunity for us to come close to what we normally only dream aboutand so it is also perfectly legal. We are pleased with our order. The chair is as described. With great joy I have received not only phenomenal service via mail, but too a beautiful chair. Solidly packed! I'll do it again. It's been a pleasure to shop at Stin.com The Egg arrived 5 days after ordering. A little long waiting time, but certainly worth the wait. Beautiful soft leather with attractive stitching, however, an extra stitch in the back, otherwise perfect. Now only needs to order a stool to the egg. Thanks for a great product. Very nice chair that adorns nice in our living room! Bought a black aniline egg chair with piping (like the original). Very happy with the quality, will shop at STIN again. I am very happy with my two red chairs, they are so beautiful, and looksgreat in the living room. I must say I was very concerned about payingthem 4th april and would only get them in week 27.Men they arrived on time great service. I would love to shop again. 100%, shortly described. Everything is just done so it is hardly distinguishable. All in all, a chair that fully lives up to what one can expect in terms of price and quality. Enjoying to the full every night.So it is only recommended to do business with Stin Furniture. Egg live up to our expectations, the seat slides out if you can not find anon-slip surface below - but this is probably also the original?? I purchased a red leather stool with eggs - I think the products are very fine. The color and quality of the leather lives up to my expectations.Stitching are dented and not so good as the originals. Your service has been super nice and I have already recommended several others to buy from you. "The egg is a very professional product. Stitching is top notch. The leather is top notch. Chair was really nice wrapped. There was no chance of damaging it during transporten.Det was the first time we acted with Stin, so we was a little tense, but everything was just OK! All our friends have expressed enthusiasm for the chair, so I guess I get more orders from Aalborg. I believe it! " After purchasing the Egg (replica), we unfortunately received a chair with some bruising and discoloration in the leather. We took some pictures of it and sent in to Stin. After some waiting, we exchanged the chair and we can now enjoy it fully ... ps. is a goodbreastfeeding chair. We have purchased Egg with ottoman in anilinskind, and are quitepleased. However, the seams are not quite as expected. The chair is not perfect however much praise, and several have stated that they will also shop at Stin Seat comfort is good and we are happy topurchase. "When I ordered the Egg, I was very nervous if I ever get something for my money, and when I got an email that said it would take further 4 weeks, I was almost convinced that something was wrong. But suddenly the carrier called me and the chair came. And it was very nice. I'm really happy with it and it is not the last time I buy from Stin. thanks for a good website. " Super nice chair looks great in my home and a fantastic service - I discovered a problem with my chair and immediately when I wrote ato Stin, I was offered an exchange without any cost. So Stin gets my warmest recommendations - I don't regret my purchase with Stin at all. 5 stars from me. It is an ornament to in my living room. Fantastic service. Fantastic products. Looks great and a furniture upholsterer in the family has said how well it’s made. Arne Jacobsen designed the chair, but since he’s dead he has no say in how it should be produced. If you like designer furniture, buy it from OSKAR. Vorfreude ist das schönste was es gibt! Ich habe im August 2015 bestellt, aufgrund der Verspätung habe ich einen Discount von 10% erhalten. Lnagsam wurde ich nervös, da die Filiale in Deutschland zum JAhresende geschlossen wurde. Am 22. Januar konnte ich mich aber über die bestellten Stühle freuen. Die Stühle sind perfekt verarbeitet und haben eine gute Qualität. Preis/Leistung stimmt. Ich hoffe das Angebot bleibt in Deutschland noch länger erhalten. I like to give 5 stars. Good service and very nice product. I am very happy with my purchase. Egg - the ultimate chair .. I have had egg + podium in the original, but they were unfortunately stolen. For me it is the ultimate chair and I have missed it ever since. Hoping to avoid further break I decided to buy the egg + podium as replica. And the quality and design is equally impressive and beautiful as the original. It is obviously advisable! Have 2 pieces of black aniline leather. Fine chairs. Good quality. "The quality of the chair is living 100% up to my expectations. Purchased the chair in black leather with a matching stool. Definitely a good experience at Stin which I strongly recommend"
Great product and super nice finish. The chair arrived on time, as advised, and has been used every day since - the quality appears to be very good and the chair is as comfortable as the "original". Excellent customer service backed up by a quality product. Really beautiful chair - red wool, the whole room lights up. We bought the egg in red wool. It came as promised after 10 weeks (although we had heard nothing in the meantime and we were getting a little restless.) It came with DSV, who sent a text message it wascoming. good arrangement. The chair is absolutely perfect, can not even tell the difference between this and the real. Special tilt feature is real, and seems completely perfect and natural! We received our egg with stool within the agreed time of 7-10 days and the quality is OK. The only thing I missed was a need confusion which was not included in the package.